Best & Easy Solution to install an Extremely High Performance Enterprise-Class PCIe-NVMe or PCIe-AHCI M.2 SSD in your Desktop for Enthusiast Gaming and Workstation's. Make High Performance PCIe Gen3 based M.2 NGFF SSD to work in desktop main board with Regular Size & Low Profile PCIe brackets support! • Convert M.2 NGFF PCIe based SSD to work in main board PCIe x4 bus slot. • PCI Express 3.0 x4 Lane Host adapter. • Supports PCIe Gen3 and PCIe Gen2 M.2 NGFF 80mm, 60mm, 42mm SSD. • M.2 NGFF type 2280-D5-M connector on board. • Movable M.2 NGFF stand-off and multiple plated-holes supports type 2280, 2260 and 2242 SSD. Features • Supports PCIe 3.0 ,PCIe 2.0 and PCIe 1.0 motherboard. • Supports dual-sided SSD module 1.5mm component height on the top and bottom side. • Compliant with PCI Express 3.0. • Pin header on board for drive LED connection. • Low Profile PCIe Form Factor. • Regular size PCIe bracket on board and Low Profile bracket included. • Transparent to the operating system and no driver required. • Windows 10, Win8.1, Windows Server 2012 R2, Linux series, Fedora, SUSE, Ubuntu, Red Hat native driver support PCIe-NVMe & PCIe-AHCI. • Microsoft (https://support.microsoft.com/en-us/kb/2990941) Update to support NVM Express by using native drivers in Windows 7 or Windows Server 2008 R2. • Mac Pro 2009, 2010 and 2012 models support PCIe-AHCI SSD only. • Supports operating temperature range: -40 - 80 ºC. • M.2 PCIe SSD power from motherboard PCIe bus slot 3.3V. 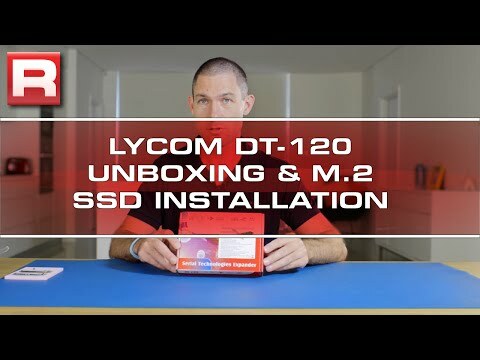 Lycom DT-120 M.2 NGFF SSD Host Adapter Card, PCIe 3.0 x4, 22x80/22x60/22x42mm, For PC/MAC/Linux is rated 4.8 out of 5 by 20. Rated 5 out of 5 by jonm from Does the job with no fuss Allowed me to use a 3rd NVMe drive in my Hackintosh with no issues whatsoever. Excellent. Rated 5 out of 5 by zofrex from Yes, you can boot from it I bought this to hold the OS drive for a system that had no spare SATA ports. Yes, you can boot an OS from it, but that will depend on the OS and your motherboard. In my case with a SuperMicro A1SAI-2750F motherboard and FreeBSD 10 I did get it working, but only after a nice man in tech support helped me figure out the BIOS options. You need to make sure both your OS and motherboard support UEFI booting from PCI-E. With the BIOS configured correctly it worked like a charm, zero problems installing or booting the OS. It's simple, it's cheap, and it does its job. Rated 4 out of 5 by HABlet from Very useful if used correctly This adapter is very cheap, but in order for it to be useful, you must be aware of what it can and cannot do. Firstly, you MUST use NVMe drives, the adapter DOES NOT work with SATA drives. Scan's website has separate categories for NVMe and SATA drives, so there should be no confusion, but a useful tip is that NVMe drives operate at very high speeds, typically more than 1000 MB per second, whereas SATA drives are limited by their controller to about 550/500 MB per second. You can plug the DT-120 adapter into any motherboard that supports PCIe. Note that the performance of the attached drive depends on which version of PCIe is in use - on a modern PCIe 3.0 board, I got very close to the advertised speeds of 2000/650 MB per second, whereas with a seven year old PCIe 2.0 board, the same adapter and drive delivered 830/560 MB - the huge drop-off in read speed is due to the fact that PCIe 2.0 runs at half the speed of PCIe 3.0 (about 1000 MB per second maximum). Fully updated Windows 7, Windows 10 and all major Linux distros support NVMe drives, so in all circumstances you can use your adapter and NVMe drive as a data drive, regardless of the behaviour of the motherboard BIOS. Older BIOSes do not recognise NVMe drives, in which case you CANNOT boot from any drive attached to the DT-120; with more recent motherboards and BIOSes, you should be able to boot from the drive attached to your DT-120. Rated 5 out of 5 by AM77 from installed easily and worked with no problem on a non M.2 equipped motherboard Installed into an old ASUS AM3+ motherboard, sure I only had x2 PCI-E transfer rates but still saw a speed improvement over the traditional SATAIII bus. note: did not show up as a device within the UEFI BIOS, windows 10 detected it and showed up in device manager with no extra drivers needed. Rated 5 out of 5 by JohnBoy from Well made, cheaper and easier to obtain than the ASUS equivalent The ASUS equivalent card had rocketed in price and was difficult to obtain, so I took a chance on Lycom whom I hadn't used before. The Lycom card is well made and worked without a problem in a PCIe slot on an ASUS MAXIMUS VIII Ranger motherboard. On this basis I'd be happy to buy Lycom in the future. Rated 5 out of 5 by Sylv from Works like a charm. Great value. I'm using this adapter with Windows 7. The card does not require any drivers. Just plugged it in, and it worked straight away. Great value. It should not matter. The controller chips on current M2 PCIe drives work at x4, so either slot will be fast enough. Your m'board has an onboard M2 connector, so it is safe to assume that you will able to boot from your adapter+drive, but you might want to confirm that with Gigabyte support, they are generally quite responsive. Good luck ! Which PCIe slot do you use this in? my board has 2 x PCIe 3.0 x16 &amp; 3 x PCIe 3.0 x1 lanes, one of the x16 has the gfx card in, does it go in the other x16 ?